The day before had been invigorating and uplifting, so we went to our breakfast in the Dining Hall with the other regulars in a much better mood, but the rest of the day was just routine. Back at the apartment, we discussed the pros and cons of Oran's resignation and different possibilities. We went to the pool awhile. Instead of going back to 'Udhailiyah Saturday morning, Oran went to Ras Tanura to see Frank Woofel. When he finally came home, he said they wanted him for a job there, and he could have it if he wanted it. Of course, there was no question about what we wanted, but Frank Woofel would have to go through company procedure and send official request papers to Oran's department to negotiate his release. So we would still have to play a waiting game. Pat and Guy Smyth had been in on all this from the beginning, so Oran said I could go ahead and tell her. She was delighted when I called, but I was still afraid to get too enthused yet. I felt a little better, though, and allowed myself to have a faint glimmer of hope. Oran had been so pleased that Woofel wanted him and it was going to be very sad for me to give up Arabia at that time. He did fly back to 'Udhailiyah the next morning, so I had the group over for coffee. Marge Williams, Kathi and I walked to the guildway house that Kathi and Roy were going to move into to look that over. Monday morning I went to Sheila’s for tea, then met her at the pool later, for the afternoon. I just tried to keep myself as busy as possible. The next day, Wednesday, was September 1st, 1976, and at least we were starting into a weekend, and hopefully soon into cooler weather. It was Ramadan, as well, not the most relaxing time to spend in Arabia. Oran came home for the evening's activities which got to be a little confusing. I had called the Kings to come over for a drink and to go to the Dining Hall with us because it was their 25th wedding anniversary, but there was no answer. When we went on to the Recreation Building with the Kauls and Adams, we saw the Kings in front of the theater, found out their phone was out of order, and told them why we had called. They had already eaten, but invited us all over to their house after we finished. So that's what we did, took their gift and went to their house, and it turned out to be a pretty nice evening after all. Thursday evening was nice as well, as there was a Sorority Progressive Dinner. The Sorority was turning out to be a godsend for me during all that troubling period of time. We started out at LuJean and Roy Yates’ for the cocktail and snacks portion, then went on to Marge and Marvin Williams’ for the main meal, ending up at Sharon and Axel Green’s for desert and dancing. Everyone looked really nice as well. Fashions for the women at that time were flattering, for parties particularly. We all wore either long dresses, long halter dresses, or party pants outfits. The men wore nice looking pants, and casual short sleeve shirts, befitting that hot time of year over there. I really couldn't see how life could get much better than what we had going for us right then in Saudi Arabia. 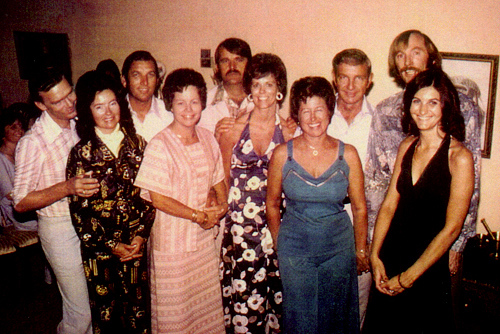 Group at the Sorority Progressive Dinner, Keith and Sheila Kaul, Marvin and Marge Williams, Roy and Kathi Steindorf, Colleen and Oran Wilson and Jack and Sandy Adams. After the weekend Oran flew back to 'Udhailiyah on Saturday and I automatically went about my regular routine, but, of course, it was hard to concentrate at all. I was trying to be guardedly optimistic, but now we would just have to continue this terribly straining waiting game, with the pendulum swinging back and forth, "stay or leave", "stay or leave", but it wasn't to be for much longer. Oran called me from 'Udhailiyah Monday evening, September 6th, 1976, to tell me that his bosses had refused to release him from the Water Injection Department, and Frank Woofel would respect their decision. What a shock! Oran told his bosses he refused to stay in 'Udhailiyah, so it looked like we would be going home for sure after all. I didn't feel too much, then, just numb. I started worrying about actually leaving during the night and what problems lay ahead for us. I felt panicky. In the morning, I called Pat and told her what had transpired, then talked to Oran again, expressed my fears, and that upset him. We talked later and tried to reassure each other that everything would be alright. I talked to Pat again, went to the pool for awhile, and tried to prepare my mind for actually going home. Thank goodness the Women's Bowling league started that night so I was busy, and able to be with people. The thing I had to do was just keep busy, very busy, as much as possible. The next day, Wednesday, I felt better and decided to try to make the best of the situation. Sheila and Marge Williams came by to talk about having a foremen’s dinner at Sheila's the next night. We decided on who would bring what. I told them what had been decided about Oran's work situation, and they expressed their disappointment. That evening we invited Jeanine and Jerry King to our house to explain what had happened. They expressed their disappointment as well, that we would be leaving. It wasn't a very happy time. Thursday morning we went to the Dining Hall for our regular breakfast. Later, we thoroughly discussed our going home and worked some things out. I put on ribs for the dinner that night while Oran took care of some business. When the time came, we went to the Kaul’s with the rest of our group, had drinks, ate on the patio, and danced afterward. But a depressing pall seemed to hang over everyone, and it was a rather awkward situation. We couldn't sleep that night. We talked more about our situation and decided to try to just accept things and look forward to the future, whatever that might be. We went to the Library to check on Greece, as we had already decided to go there for a few days on our way home. The only other thing we did that Friday was go to the pool. Saturday, September 11th, 1976, Oran flew back to 'Udhailiyah. I caught the 7:30 bus to Dhahran and met Pat Smyth in the Dining Hall. She went to Al-Khobar by bus while I took some tax papers by the Administration Building then caught a taxi to Al-Khobar to join her. After shopping until prayer time, we caught the bus back to Dhahran and had lunch together in the Dining Hall, where we talked about our situation more thoroughly. It would have been nice to have lived in the same camp as the Smyths again, although I had mixed emotions about leaving Abqaiq now. We both caught our buses back to Ras Tanura and Abqaiq. That afternoon I went to the travel agents’ office to talk to Kevin about our trip home. Then I talked to Jeanine about the party they were having on Thursday night. She had invited Pat and Guy, as well, so they were coming down to spend the night with us for that. There was nothing to do but just keep on with all the activities until we left, but my heart wasn't really in any of it. Sunday morning, I went to Kathi's for coffee, then to Sharon Green's to get tickets for a dance that was coming up Wednesday night. I met Sheila and Marge Williams at the pool after that to sun for awhile. When Oran came home from 'Udhailiyah that afternoon, we went back to the pool, then to the Adams’ to see their slides on Greece. Oran didn't go back to 'Udhailiyah on Monday, so I cooked breakfast, then went to the pool to join the girls while he went to see the personnel man. He came back by the pool, so we went to the Snack Bar for lunch. That evening I bowled in the mixed doubles league with my partner, Bob Howie. Oran watched awhile. On Tuesday morning, I went to the shipping office to ask for a packing date (guess we were really going home). When I met the girls at the pool later, we took pictures, sunned until about 12:20, then went to the Dining Hall for lunch. I knew I would really miss these outings with the girls. Heck, I was going to miss it all. I started preparing food for the weekend on Wednesday morning before going to Joyce Kirkpatrick's with Marge Williams to eat lunch and play bridge. When Oran came home from 'Udhailiyah we joined the group at Harriet and Bing Fretwells, then we all went to the school gym for the "Drifters" performance and dance. The performance was pretty good, but too long. There was not enough time to dance. We joined the Adams Thursday morning at the Dining Hall for breakfast. Then I prepared more food before Pat and Guy arrived about 1:30. We called Patti York over to meet them, have coffee, and visit. They had known Burl from the early days in Ras Tanura, as well. Then everyone rested before going on to the Kings’ for their party. The evening weather was starting to cool off, so they had set up tables and chairs on their walled in patio of their rowhouse. Each table had a cloth and a glowing candle, which created a very nice atmosphere. Again the women wore pretty long dresses or party pants suits. I had on a peach-colored, soft knit, low rounded-neck flattering top with pants to match. Roy Steindorf had called me a "Georgia Peach" when he first saw me in that outfit. Although I was 48 that summer, I weighed just 128 lbs., had a great tan, and probably looked better than I had looked since I was a very young woman. That, at least, made me feel very good at that time. All in all, it was a very lovely dinner party. We had invited Jack Hayes to come in from Qurayyah, where he had been transferred, to see Pat and Guy Friday morning. They had known each other in the early years in Ras Tanura, too. We had tomato juice and coffee and visited, then all went to the Snack Bar for breakfast. Before Jack left, we took pictures on the lawn of our apartment in front of the large date palm tree and the oleander hedges. It was a nice reunion. After Pat and Guy left to return to Ras Tanura, Oran and I just prepared things for the coming work week. It had been a full weekend, but that was good. On Saturday, September 18th, 1976, I went to the travel office to talk to Kevin to firm up our itinerary for our trip home. It had been decided we would leave there October 21st, go to Greece for a few days, then to Rome for a few days, and maybe take a train to Paris. The last part was still uncertain, but we wouldn't be in a big rush to get home, as it would probably be our last opportunity to travel in Europe. At least there was something I could look forward to. At the Post Office after that, I ran into Sheila and Sandy, so we went to the Snack Bar. Sheila went back to my apartment with me to talk about the trip, the party last Thursday night, our going home, etc. That evening when I talked to Oran on the phone, he said he was feeling better and had asked for a meeting with the Vice President of Aramco, Ali Naimi, and it shook up his bosses. I didn't know what good that would do now, but there was never telling what Oran might do next, or where it might lead. I went back to the pool with Kathi and Sheila Sunday morning, then met Sheila there again after lunch for the afternoon. I wanted to go home with a really good tan, as it would probably be the only one I'd ever work on after that, unless we happened to get a back yard pool someday. I would have about a month to work on it with a vengeance. After that, I took my long, red dress to Sheila's, as she had said she would help me alter it. We decided to go to Kathi's for iced tea when we were finished, but I returned to Shelia's after to have dinner with her and Keith, who was home by that time from his job on the Sea Water Project. I called Oran from there before Sheila and I went to our Sorority meeting at Melody Buescher's house. As we went through the regular, familiar procedure, I felt a sad detachment, as I knew I wouldn't be there to attend any of the future meetings, rituals, or socials they discussed that evening. Sharon Green, my secret sister, revealed herself and gave me a gown set. Everyone expressed their disappointment that we would be leaving, so it was a very emotional meeting for me. Monday morning Jeanine King called to tell me that Milo Cumston was interested in our situation, but I didn't know what good that could do. It was nice to know people were concerned, though. I met Sheila at the pool, stayed until about 3:30, then we went to the Post Office. That was not just to check the mail, but to see and be seen. The Post Office was a general gathering place for everyone over there, especially around 3:30 to 4:30 in the afternoon when the mail that came in on the 1:30 bus from Dhahran was being placed in the boxes. The employees were coming by after they got off work at 4 o'clock before going on to the Commissary and home. It was a regular beehive of people at that time every day, the largest crowd you would ever see anywhere, anytime in public in our camps, except at a large social function. That day we ran into Kathi, so we all went to my house for a cold Pepsi. Later, when Oran got home from 'Udhailiyah, we talked about our various activities for the past few days. The Adams’ came over to bring us the keys to their house, as they were leaving on a trip during the upcoming holidays to Nepal and India, and wanted us to check it while gone. They also said we could use their roof patio if we wanted to. After they left Oran called one of his bosses, and they had a long, heated conversation, probably about his call to Ali Naimi. I wondered what the outcome of that would be. It was imperative for me to stay busy, so after Oran flew back to 'Udhailiyah Tuesday, September 21st, 1976, I went to Harriet's where I bought some clay figures that she had made called, "Clyde, the Camels". Back home, Oran called to say that he had been talking again to his boss, and would fly back to Abqaiq after lunch to talk to the one in Abqaiq. I went on to the pool for awhile, then to Sheila's to work on my long, red dress again, and have tea. While there Oran called to say he was at the pool and wanted us to bring him a towel. Kathi had joined us by then, and we were all curious about what was going on, so we went to the pool together. But Oran just visited pleasantly with us, never indicating how his conversation with his boss had gone, and I didn't want to press it then. So we girls went on to the travel agent's office, then to look at the guildway house on llth Street that Kathi and Roy would move into. When I got back home, Oran was back from the pool, as well, and told me that orders had come down from personnel in Dhahran to his bosses to work something out with him. So, after all that talking, they had reached an acceptable compromise they could all live with. Oran had agreed to stay no longer than six months more in 'Udhailiyah, and after that he would be transferred to another area or could take another job within the company, if he wanted to. Guess his talk to Ali Naimi had an effect after all. So, even though we had our travel orders in, our plane reservations, our shipping date, etc., it looked like we would be staying for awhile longer, anyway. That was close. Anyway, here was a temporary reprieve at least, and I felt a rather uneasy relief and happiness. This had all been a trying and traumatic period and both of us had a few more gray hairs to show for it, but we did have to feel good that another decision had been put to rest. We went on to the Dining Hall for dinner that evening, then while I bowled in the league, Oran wrote his resignation retraction letter.